Don't forget to check out our page on Water Polo Trivia! Johnny Weissmuller (1904 – 1984) was one of the greatest swimmers in history. He became famous from his film career. In 1929 he made debut on the big screen, but he became world famous for his part as Tarzan in the movie Tarzan, the Apeman from 1932. He played in 12 Tarzan movies, earning the - in his days enormous - amount of 2 million dollars. He also appeared as Jungle Jim in 13 movies baring the same name. 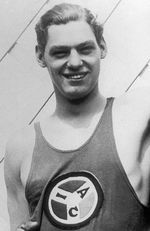 Johnny Weissmuller has never lost a swimming competition in his entire career, became 52 times national champion of the USA and broke 67 world records. He was the first swimmer to swim the 100 meters freestyle in less than 1 minute. On the 1924 Olympic Games in Paris, he won the gold medal on the 100 meter and 400 meter freestyle and on the 4 x 200 meter freestyle relay. 4 years later he would add another 2 gold medals (100 meter freestyle and 4 x 200 meter freestyle) on the Olympics in Amsterdam. He competed with the USA national water polo team on 2 Olympic Games and won the bronze medal on the 1924 Olympics, finishing after France (gold) and Belgium (silver). He once said: "Water polo's a rough game. That's where I learned to duck. It came in handy when Cheetah started throwing coconuts." Johnny Weissmuller died in 1984 from a heart condition, lonely and broke after 4 failed marriages. Bud Spencer, born in 1929 as Carlo Pedersoli, became famous as an actor in Italian Spaghetti Westerns at the side of Terence Hill. His trademark was to end fights hitting his opponents on top of the head with his fist. Carlo Pedersoli graduated in law and has several patents in his name. He's a helicopter and aeroplane pilot and owns an air freight company. Bud Spencer used to be a successful swimmer and water polo player. He was the first Italian to swim the 100 meters freestyle in less than 1 minute. It is said that Carlo Pedersoli won Olympic Medals, but this is doubtful. 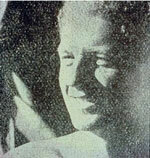 Carlo Pedersoli competed with the Italian national water polo team and won a gold medal on the 1955 Mediterranean Games. Although often stated, he did not compete with the Italian team on the 1952 and 1956 Olympics. He did participate in the swimming event of these olympic games. He won the Italian championship in 1954 with his team S.S. Lazio. In 1967 Carlo Pedersoli changed his name officially in Bud Spencer as a tribute to the then recently passed away actor Spencer Tracy and his favourite American beer. Later in his life Bud Spencer was into politics: he was a candidate for Forza Italia, Prime Minister Berlusconi's party, for the regional elections of 2005. Bud Spencer died on 27 June 2016 at the age of 86. Gerard Blitz was a Belgian Jew who played for the Belgian national team that won 3 Olympic medals in the 1920 Olympics in Paris (silver), the 1924 Olympics in Antwerp (silver) and the 1936 Olympics in Berlin (bronze). He also swam the bronze medal on the 100 meter back stroke on the 1924 Olympics and was the World Record holder on the 400 meter back stroke from 1921 to 1927. 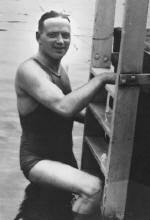 In 1990, Gerard Blitz was admitted in the International Swimming Hall Of Fame. His nephew, who was only 10 days younger and carried the same name, also played water polo. He was in the resistance during the Second World War. The Belgian government asked him to build camps for the returning soldiers. This gave him the idea to set up a "holiday camp". It was an instant success and today his Club Med is one of the 10 largest hotel chains in the world. Duke Kahanamoku (1890-1968) was a member of the Hawaiian Royal Family. He was an excellent swimmer and made his first appearance on the Olympics in 1912. In the final of the 100 meter breast stroke he was so far ahead that he stopped halfway to look at the rest of the field. Nevertheless he won 2 meters ahead of the second place. By then he already equalled the World Record during the qualifications. In the 1920 Olympics, he won the final... twice! The first final was annulled because of an irregularity. In the 1924 Olympics he came in second after Johnny Weissmuller and before his brother Sam Kahanamoku. In total he won 3 gold and 2 silver Olympic medals on the Games of 1912, 1920 and 1924. Duke Kahanamoku was a pioneer in the sport of surfing and invented wind surfing. In 1925 The Father of Surfing rescued 8 people from drowning using his surf board, after a boating accident. He played minor parts in 28 Hollywood movies and a lead role in the movie that would mean the breakthrough for the surf sport. He also was sheriff of Honolulu for 30 years. Duke Kahanamoku competed with the USA Olympic water polo team that finished fourth on the 1920 Games in Antwerp. He was a back-up player for the team that won the bronze medal on the 1932 Olympics in Los Angeles. Today there is a statue of Duke Paoa Kahanamoku on Waikiki Beach. Jean-Marie Faustin Goedefroid de Havelange was born in 1916 in Rio de Janeiro from a Belgian father and a Brazilian mother. João Havelange has a degree in law and is managing director of several companies. He has had an impressive career as a member of several sports federations like the International Olympic Comity, but is especially known as chair man of the FIFA, which he has been for 24 years (1974-1998). In 1988 he was nominated for the Nobel Peace Price. João Havelange also was successful in many sports. As a swimmer he became Brazilian and South-American Champion and he competed in the 1936 Olympic Games in Berlin. With the Brazilian national water polo team he won the silver medal on the 1951 Pan-American Games and he competed on the 1952 Olympics in Helsinki, at the age of 36. The Estádio Olímpico João Havelange in Brazil was constructed for the 2007 Pan-American Games. Matt Biondi was born in 1965 and learned to swim from his father, a former water polo coach. During his first competition he false started twice and lost his swim suit on the dive. From early on Matt Biondi competed both in swimming and in water polo. He always said the combination of both sports kept him mentally sharp. During his first year at the University of California, he won the NCAA National Water Polo Championship with his team. He would win it twice more. In 1984 he competed in the Los Angeles Olympic Games, where he won the gold medal on the 4 x 100 meter freestyle. In the Seoul Games (1988) he won 5 gold, 1 silver and 1 bronze medal and set 4 new World Records. In his last Olympics in Barcelona (1992) he added another 2 gold and 1 silver medals. His 11 Olympic medals was an all time record that was only beaten by Michael Phelps he won his 14th Olympic gold medal at the Beijng Olympics in 2008. Matt Biondi also swam 12 world records. Four years later he would add another 4 World Championship medals in Perth. He was elected Swimmer of the Year by Swimming World Magazine in 1986 and 1988. Robert Lantos, born in Hungary in 1949, is a film producer. His best known films are Johnny Mnemonic (1995 - with Keanu Reeves), Crash (1997 - from David Cronenberg), The Sweet Hereafter (1997) and eXistenZ (1999 - from David Cronenberg and with Jude Law). He is also the man behind the '80's hit series Night Heat. He was made a member of the Order of Canada and is an Honorary Doctor of Letters at the McGill University. Robert Lantos was an international water polo player and competed with the Canadian team on the Macabiah Games in 1969. He played on the Canadian championship Montreal YMHA (Young Men's Hebrew Association) team. 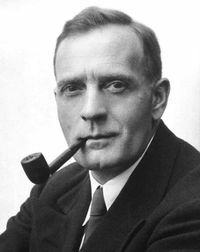 Edwin Powell Hubble (20/11/1889 – 28/09/1953) was an American astronomer. Hubble was able to prove in 1923 that the astronomical "nebulas" were in fact seperate galaxies, which proved that the universe was far greater than expected till then. One of his most important discoveries was the connection between the red shift of distant galaxies and their distance to the earth. This made the theory of an expanding universe plausible. He helped the construction of the gigantic telescope on Palomar Mountain (see photo - Hubble is the man on the right) and the wotld famous Hubble space telescope was named after him. Edwin Hubble played water polo in the Oxford University team where he graduated in Spanish and Roman law in the beginning of the 20th century. Prince William, born in 1982, is the eldest son of The Prince of Wales Prince Charles en the late Princes Diana. He is second in line of succession to the throne of the British Monarchy, after his father. Prince William played basketball, rugby, football, hockey, crack clay pigeon shooter, hunting and swimming. Prince William is studying at St Andrews University in Scotland where he competes on the university water polo team. In 2004 he competed for the Scottish University Team in the Celtic Nations tournament against Ireland in Wales. In 1984 Peter Ueberroth (°1937) was named Man of the Year by Times Magazine. He earned this title by his flawless organisation of the 1984 Olympics in Los Angeles. It were the first privately organised Olympics and they were concluded with a 250 million dollar profit. After this success, Peter Ueberroth became chairman of the American Major League Baseball. In 1992 he was responsible for the reconstruction of Los Angeles after the riots. At the moment Ueberroth is on the United States Olympic Committee board of directors. 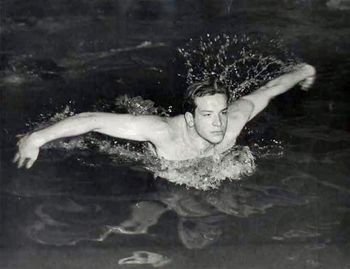 Peter Ueberroth was a talented water polo player who competed in the trials for the 1956 Olympics, but he did not make the team. Sean Paul Henriques was born in 1973 in Kingston, Jamaica from a Portuguese-Jamaican father and a Chinese-Jamaican mother. Like his mother, a well-known Jamaican painter, Sean Paul became an artist. He is known from hit singles like Get Busy, Like Glue and We Be Burnin. His 2002 album Dutty Rock sold platinum twice in the USA and the UK. His latest album The Trinity (2005) sold gold in these countries. He has worked with artists like Busta Rhymes, Beyonce and The Neptunes. Sean Paul came from an athletic family and was a gifted swimmer in his younger years. He competed for the Jamaican national team during the Carifta Games in 1989 and 1991. He also was on the Jamaican national water polo team. 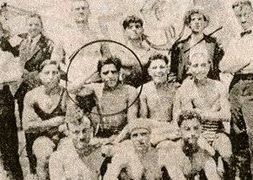 In August 1922 the Greek club "Pelops" form the city of Smyrna organised a swimming and water polo competition in the Gulf of Smyrna. One of the participants was Aristotle Onassis, who later became famous as Greek shipping tycoon and one of the richest people in the world. Sir Alexander Fleming (1881-1955) was the son of a Scottish farmer. He attended St. Mary's Medical School in London, because they were the only medical school with a water polo team! Sir Fleming would be at this school during the rest of his career and became director. Sir Fleming is known for his discovery of the first antibiotic: Penicillin. In 1944 he was knighted an in 1945 he won the Nobel Price for Medicine for his discovery. Sir Fleming dies of a heart attack and was buried as a National Hero in Saint Paul's cathedral in London. Steve Smith (°1958) is an astronaut. He flew 4 times in the Space Shuttle (in 1994, 1997, 1999 and 2002) and travelled more than 25 million kilometres in space. He has made a total of more than 49 hours of space walks. The most famous one was his repair of Hubble Space Telescope in 1997. Steve Smith attended Stanford University and was a 7-fold All American in swimming and water polo, two-fold champion of the National Collegiate Athletic Association (NCAA) in water polo and captain of the NCAA championship team in 1980. Paul Martin: the former Canadian Prime Minister played water polo at university. Fred Deburghgraeve: former World Record holder on the 100 meter breast stroke and only Belgian gold medallist in a swimming event ever (on the Atlanta Olympics - 1996) used to play water polo in his spare time. Captain Jonathan Archer: in Star Trek: Enterprise the character of the captain (played by Scott Bakula) played water polo at Stanford University. He keeps track of scores and follows water polo games with his friend Trip. He carries a water polo ball on board. Ted McGinley: the actor, known for his part Jefferson D'Arcy in Married with Children and Roger Phillips in Happy Days, was captain of the water polo team on the University of South Carolina. Robert Langdon: the main character from the best selling novels Angels and Demons and The Da Vinci Code (filmed with Tom Hanks as Robert Langdon), played water polo. Luke Ward: the character form the television show The O.C. played by Chris Carmack, is captain of the water polo team.